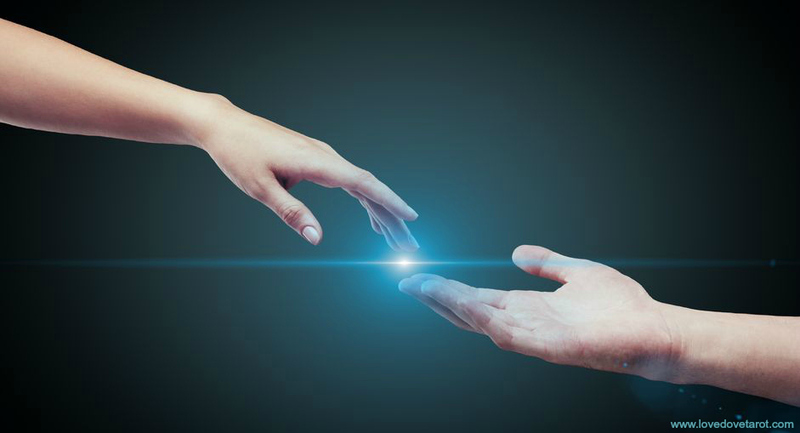 Learning to trust again after you have suffered deep betrayal or cheating in love can be very tricky. One reason for this is the feeling of confusion after you find out that what you thought was real was a complete and utter sham – counterfeit love… You dreamed of True Love, got too close to the sun… You crashed and now you’re wondering if your wings will ever grow back out again. The fear of experiencing this kind of pain again could make it tempting for you to isolate yourself. There is a way to start trusting again but the truth is that love will never be a risk-free venture. The best you can do is take your time in getting to know someone new before you go giving your heart away. In fact, make sure you know all of his friends and his family too! Leave no stone unturned to make sure he is worthy of your affection. In the end you will have to take a leap of faith but it’s up to you how big a leap. Do you really need to attempt the Grand Canyon and possibly end up with someone who was after your bank account, your daughter or a Visa from your country of birth? Other than taking it slow, you need to surround yourself with loving people as well as think only the most positive and loving thoughts you can, both about yourself and about love relationships. This ensures that you grow better and not bitter. Let’s ask the Angels of Love for a wee bit of help with this. There is this beautiful, positive and gentle Love Oracle called Whispers of Love. 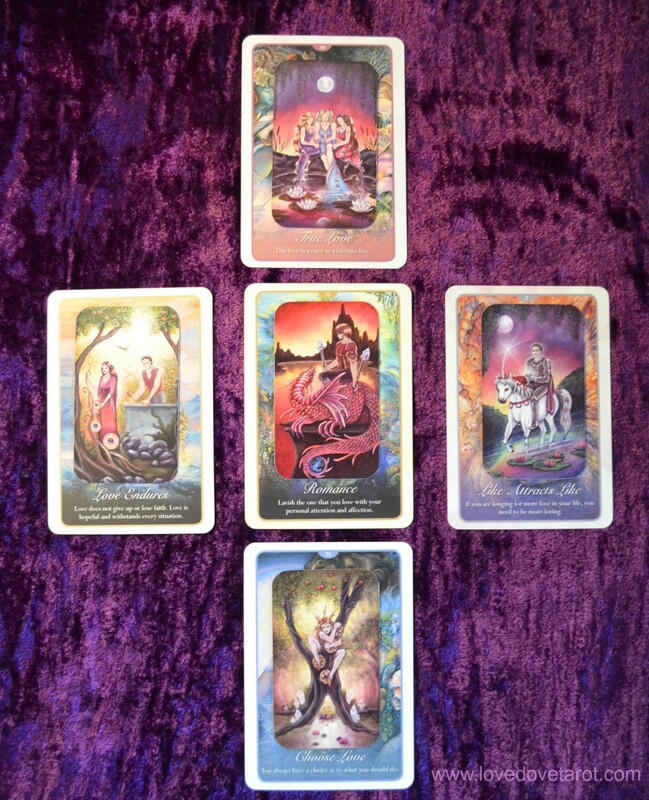 The deck itself inspired this spread and you can use the 5 card Oracle Spread on its own or combine it with the Tarot which I have chosen to do below. 1. Central card. New love theme for you to contemplate. This ties in with what awaits around the corner. 2. East/Air (right) Bear this in mind. This is the most important thing for you to be mindful of in relationship choices/problem solving you might face right now. Make a positive affirmation of this card’s theme and repeat it to yourself often. 3. South/Fire (bottom) Be courageous in this way. This will take you outside your comfort zone. 4. West/Water (left) Have faith/rejoice in this. This adds a feel-good factor. Remind yourself often to think/do this! 5. North/Earth (top) You can manifest this. This is something you will soon be able to manifest for yourself in physical reality if you keep visualising it. 1. Central card: Romance + 2 of Wands. A new relationship with lots of spark is waiting just around the corner. The 2 of Wands carries a warning that there may be a temptation to dive head in first again. Nice and steady does it! 2. East: Like Attracts Like + Knight of Cups. 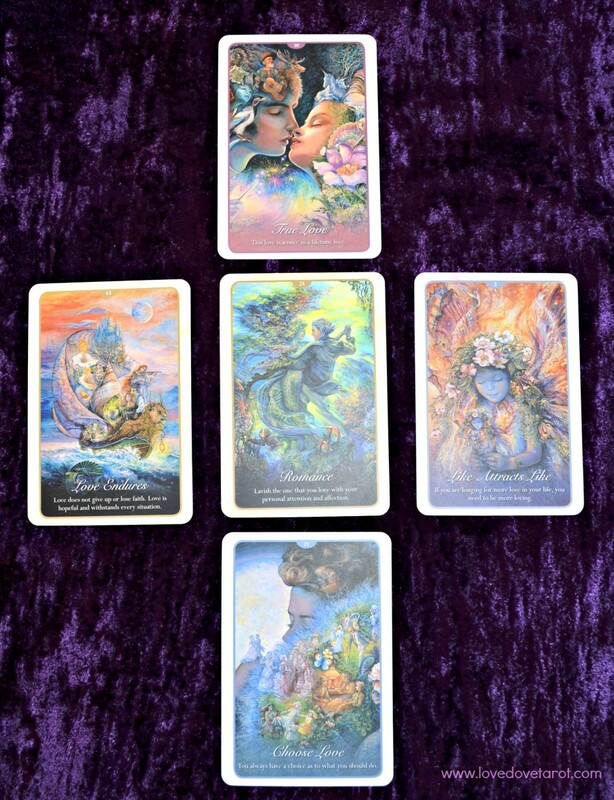 If you truly wish a deep and heartfelt romantic connection, be more like the Knight of Cups! 3. South: Choose Love + 4 of Pentacles. Find a healthy balance between expressing love and keeping your boundaries intact. Don’t let fear hold you back but only push past your comfort zone in the name of self-love. 4. West: Love Endures + 3 of Pentacles. Partners who work together stay together. What would being together with a lover who works toward the same goals as you feel like? Capture the joyful essence of this feeling in your heart and let inspire future choices. 5. North: True Love + 3 of Cups. You will very soon be able to manifest a celebration of true love.